I made this wallpaper quite some time ago, I retouched it a bit because I think the contrast on it was too high, I like the idea but I'm not completely happy how this came out, I'm posting it because I'd like you guys to see my work and because this has been the most ripped and stolen wallpaper I have ever done .. sorry just had to say it >< .. hope you like it.. see ya later alligator. note: I edited the spelling error.. sorry about that ^^;; , so let's try it again. Oh! Kikyo!!! She is my favourate in Inuyasha!! Thanks for your good work!! YAY!! !a kikyo wallpaper worth praising make some more kikyo walls pls!!! awesome! there aren't enough Inuyasha wallpapers on this site and this one does a good job of making up for that fact. too bad it's such a small resolution though...anyway I love it! I love it! It looks so ethereal. This will have to be my favorite Kikiyo wall! ^^ I don't like her too much but I love this wallpaper--- it's so nciely done. Great wall! I love how she looks, sad and distant. She really is beautiful and you've captured that beauty well. How?How did you do it? This wallpaper is the meaning of beauat!! Ahh! One of the better Inuyasha walls. Thanks! very nice, kikyou is one of my favourite characters in Inuyasha. You've given her a nice mystical edge, which is good because she reminds of a tennyou in the manga. oooh! Kikyo! she's so pretty! ^^ i really like the night blue color you choose! great job! wow, that's beautiful wallpaper, I like the background. 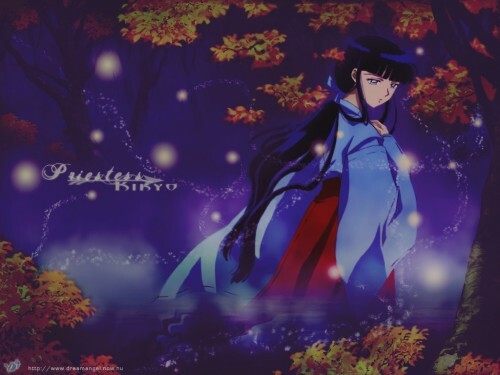 :) and Kikyo is awesome too.